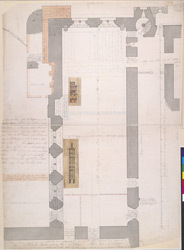 This is very detailed plan was drawn in 1800, and had additions made to it in 1817 and 1818 by the original draughtsman. Individual coloured sections of the tiled floor are detailed. The Painted Chamber contained hundreds of medieval war paintings, but was destroyed by fire in 1853. Surviving panels from the ceiling are held in the British Museum.